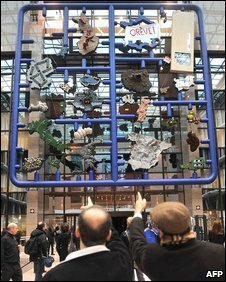 BBC reports on A new art installation going on display at the European Council building in Brussels that has angered EU members with its lampoons of national stereotypes. The Guardian UK weighes in too. “Entropa is not a real pan-European work by artists-provocateurs, but a mystification. At first glance, it looks like a project to decorate official space, which has degenerated to an unhindered display of national traumas and complexes. Individual states in the European Union puzzle are presented by non-existent artists. They have their names, artificially created identities, and some have their own Web sites. Each of them is the author of a text explaining their motivation to take part in the common project. That all was created by David Cerny, Kristof Kintera and Tomas Pospiszyl, with the help of a large team of colleagues from the Czech Republic and abroad. Visit David Černý’s site to read the whole description.